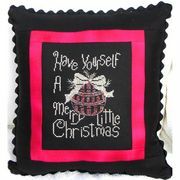 This counted cross stitch design from Bobbie G features Father Christmas, shown with buttons decorating his coat edge, these are not provided. The kit contains 14 count black aida fabric, DMC stranded cottons, needle, chart and instructions. Unfortunately this item is discontinued and is no longer available.